Trucks.com introduced the idea of Adventure Drives to help us report on how trucks, SUVs and crossovers and accessories perform during real-world getaways. But, realistically, even the most avid adventurer will put the majority of miles on their vehicle during mundane tasks such as commuting, hauling family members and grocery shopping. To fully evaluate vehicles and their gear, we are introducing a new feature: Long-term Vehicle Tests. Regular updates over a period of 12 months will cover an in-depth evaluation of a vehicle and its features as a daily driver and on adventures drives. Our first long-term test vehicle is a diesel-powered 2019 Land Rover Range Rover HSE. It was purchased new. Why the Range Rover? Several vehicles claim to have started the whole SUV category, and the Land Rover is certainly in the mix. Images of the classic Land Rover Defender covered with mud as it traipses hill and dale over the English countryside give the brand and its current lineup serious adventure credibility. Land Rovers emphasize off-road capabilities. Their fording depth, approach and ramp angles, ground clearance and off-road powertrain features provide the capability to both go off-road and take the off-road-like potholes of today’s highways in their stride. 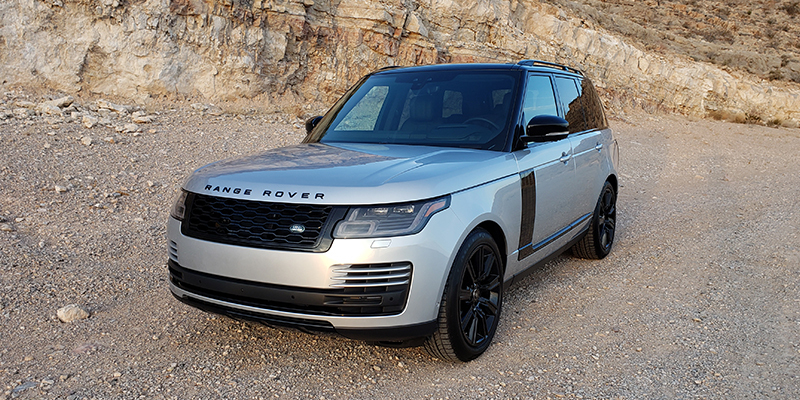 Land Rover also is one of the few SUV manufacturers to offer a diesel engine as an option for its vehicles sold in the U.S. Various automaker emissions scandals have given diesel technology a black eye in recent years, but the diesel in the Range Rover is fully EPA-compliant. It is based on the diesel engine Ford offers as an option for F-150 pickup trucks. Ford once owned Land Rover. The diesel engine option adds $2,000 to the price of the vehicle. Our test vehicle has a suggested price of $113,195. Diesel matters because of its impressive fuel economy and the range it provides a vehicle that will go on long trips and remote adventures. The vehicle has Jaguar Land Rover’s 3-liter 6-cylinder turbodiesel engine. It produces up to 254 horsepower and 443 pound-feet of torque. The diesel-powered Ranger Rover HSE had an Environmental Protection Agency fuel rating of 22 mpg in city driving and 28 on the highway. This compares with 17 in city and 23 on highway for the standard gasoline engine. The fuel tank in our tested Range Rover holds about 22 gallons, providing more than 600 miles in range for highway driving. Range matters in an adventure vehicle because it opens options in terms of trekking to locales where there are no fuel stations, without having to carry extra fuel jugs. And if you do decide to bring along some extra fuel, diesel has an additional safety advantage: It is much less flammable than gasoline. Still, diesel can occasionally be a hassle. The fuel is more expensive. It is running about 7 percent more than regular gas. But the Range Rover diesel engine gets about 20 percent better fuel economy than the gas engine. Owners will actually save at the pump. Also, while not all stations sell diesel, it is easy to find on the interstates because it’s the same fuel big trucks need. But there’s one more wrinkle. The Range Rover also requires DEF fluid to meet emissions regulations. A gallon runs between $30 and $40. The fluid is injected into the exhaust to reduce nitrogen oxide emissions and runs out in 8,000 to 10,000 miles, depending on driving conditions. It pays to carry an extra half-gallon with you; the SUV won’t start without it. We’ll let readers know how this goes. The first segment of our long-term test is the technology package. Trucks.com started with that because it was an area of concern from shorter test drives of Range Rover vehicles. The test started with almost no miles on the vehicle. Jaguar Land Rover has equipped the SUV with its new In Control duel-screen infotainment system. This is primarily a touch screen-controlled system supported by a few voice commands. Our view is that touch screens are great for immersive devices like tablets, but in many vehicles – including the Range Rover – they are distracting in a driving situation. Other manufacturers also offer overly complex touch screen-based infotainment systems. Ford’s Sync 3 is an example. Some data show that infotainment systems where the primary input is via a physical controller provide less driver distraction. BMW’s iDrive is probably the benchmark, but Mazda has something similar and is moving away from touch screen controls. These minimize the time spent looking at a screen and allow more time to be spent looking out the windshield. Another issue with Land Rovers in particular is that we have experienced a variety of glitches involving unacceptable screen lags in the new system. 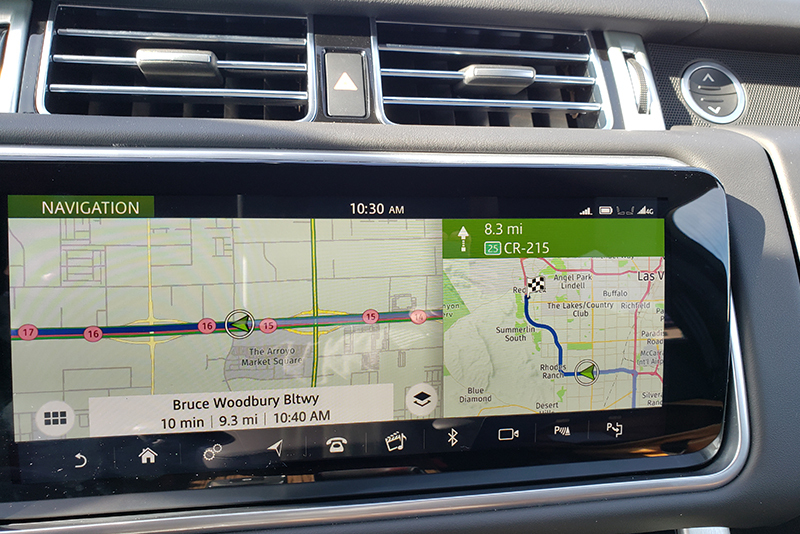 The voice instructions on a Range Rover Velar we tested gave an instruction that conflicted with the directions on the dash screen. Prior to the start of our 12-month test, Trucks.com borrowed a Range Rover Sport, with the same InControl infotainment system, to once again test the system. The system proved to be as frustrating as expected. But a trip to the local dealer found that the Range Rover Sport was running version 2.5 of the InControl software. This was over 12 months old. The dealer performed a software update. That corrected much of the system instability, and screen lag vastly improved. Still, anyone driving a Range Rover should be sure they are running the latest version of the software. The system also seems extremely customizable, so we will be interested to see if this can help mitigate our concerns about touch screens being distracting. We will cover this and lots more in an in-depth future post on our time with InControl. Wheel size is another issue with Range Rovers. As with touch screens, it is not limited to Range Rovers. The smallest wheel size offered is 21 inches. Range Rover should offer 20- or even 19-inch wheels. Buyers think large wheels look better. Unless they hit a really big pothole, larger wheel sizes aren’t usually a huge problem. But for even limited off-roading, a smaller wheel with more rubber is the way to go. Manufacturers should offer more flexibility with wheel sizes and tire types. Fortunately, even with 21-inch wheels, the Range Rover tires have roughly 4 inches of rubber between the wheel and the road. Some of these options make the Range Rover look cool. Most, however, are serious choices. We will look at the key options in depth in later posts, but for now, here is a brief overview. DRIVER-ASSIST PACKAGE: This includes blind-spot monitoring and assistance, traffic sign recognition, adaptive cruise control with queue assistance, active steering assistance and emergency braking. It also includes a 360-degree surround camera. Blind-spot monitoring, adaptive cruise control, lane-keeping assist and emergency assist are the must haves in this package. MERIDIAN 815 W SOUND: Not really an essential option, but who doesn’t like great sound on a long journey? VISION-ASSIST PACKAGE: This includes LED headlights with auto high beam, front fog lights, and, most importantly, a head’s up display. It also includes configurable ambient lighting. TOW PACKAGE: Offers a tow hitch receiver, along with trailer back-up assistance. We are not sure what this has to do with towing, but the package also includes a Land Rover Activity Key. FRONT CONSOLE REFRIGERATOR: Stores four bottles at a refreshing 41 degrees (only operates when the engine is running). It also has a quick cool function. Another not-essential-but nice-to-have feature for long drives. WADE SENSING: We will be testing this later, but for now, it looks like this helps monitor water depth. It doesn’t change the maximum wading depth: All Range Rovers are rated as capable of “wading” through almost 3 feet of water. 20-WAY HEATED/COOLED SEATS: Not much to add about this option. ALL-TERRAIN PROGRESS CONTROL: This acts as an off-road cruise control. TERRAIN RESPONSE CONTROL 2: Auto changes drive mode based on terrain. ROOF RAILS: Along with a tow hitch, another Trucks.com must-have option. SMARTPHONE PACKAGE: Apple CarPlay and Android Auto. A no-cost option. Trucks.com learned through the ordering process that this configuration is rare. The biggest issue seems to be the tow hitch receiver. 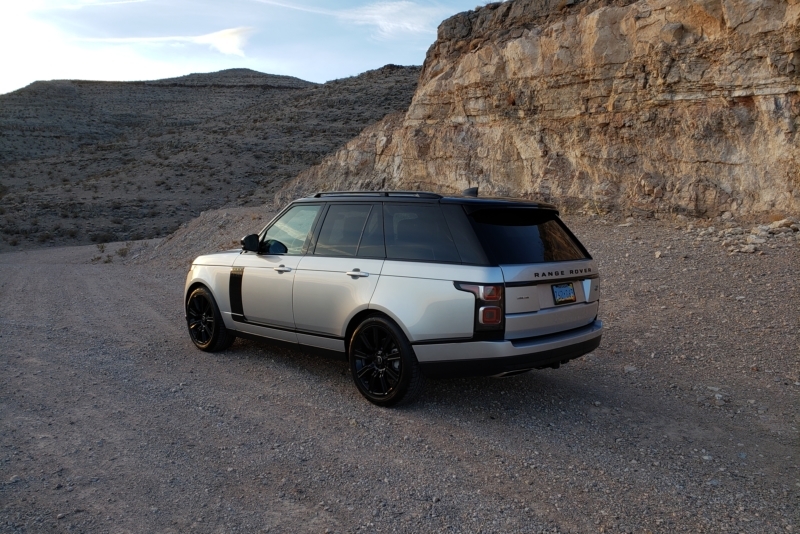 Finding a Range Rover in dealer inventory with a hitch receiver is difficult – let alone one with a diesel engine. A hitch receiver can always be added by the dealer, but the cost is over $2,500, and you don’t get the electronic towing aids that come with the tow pack. Trucks.com wouldn’t consider getting an adventure vehicle without one. The Range Rover will be based at Trucks.com’s Las Vegas hub. This provides the opportunity to report on hiking (Red Rock and the Grand Canyon), biking (all over), towing a small boat (Lake Mead), skiing (Brian Head, Utah, and Mount Charleston, Nev.) and longer trips to try out off-roading (probably in Mexico) as well as typical daily driving. For each of these adventures, we will try out various associated accessories.